No Christmas party can be complete without someone wearing an ugly Christmas sweater. I am going to be that person this year. 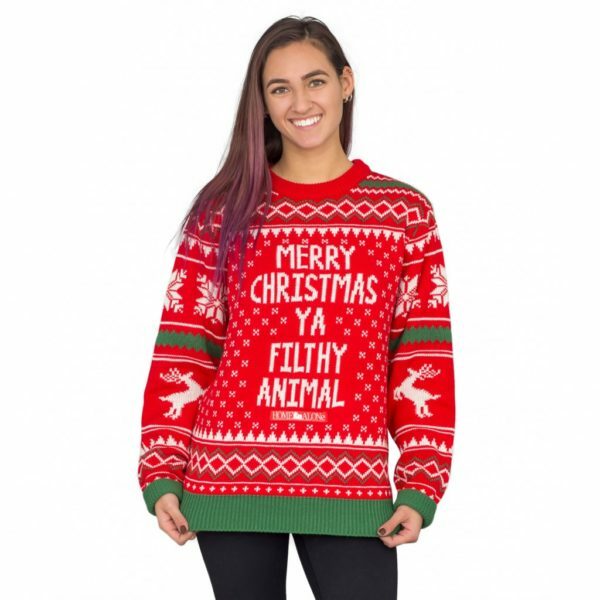 The Women’s Merry Christmas Ya Filthy Animal Snowflake and Reindeer Ugly Sweater is the perfect sweater for our Christmas Eve party. This Christmas is a little different for me. I honestly was in a funk about it for awhile not knowing how to continue traditions knowing that my last surviving grandparent (my grandma) was in the nursing home for her first set of big holidays. I racked my brain with ways we could keep things as “normal” as possible and how we could make sure that traditions stayed remotely close to how they had been in the past. My Grandma isn’t in a position where we can transport her back and forth for a get together so that was out of the question and she was always the Christmas Eve host. This was a promise that was made to my Grandfather when he was having his last Christmas which was also my first in 1985 that my family would always gather on Christmas Eve. Anyway… fast forward to months of thinking, mulling over ideas and finally I decided I would host. I called up my Dad and his brother and invited everyone over. It was settled: finger foods, some Christmas games and presents for the kids. I pulled out my decorations, some that are family heirlooms and others that I have bought myself and really went to it. Our tree is the biggest ever and y’all I even decorated the fronts of my kitchen cabinets in ribbon and bows. While family times are not always what we remember them it is time to begin new traditions that my boys can grow up with. In the meantime we always have to carry on the ugly Christmas sweater tradition HA! I love that there is a go-to shop online where I can even coordinate my ugly Christmas sweaters with matching socks, leggings and they even have pajamas. The material is by far some of the softest sweater material I have ever felt for a novelty product. Often we think of these types of sweaters being itchy and overly hot. Not this one! I love the feel of it and think that it will only become more comfortable with washings. I am happy to say that paired with some leggings I am sure to be the talk of our Christmas gathering. Featuring sizes up to 4XL this company really showcases a great variety of unique Christmas apparel and allows for anyone to find just the perfect item to wear to their favorite Christmas party. Be on the look out for a photo of me wearing this sweater. My photographer was busy playing his video game today on this lovely snow day and I didn’t think a mirror selfie would do this justice.